PVGuard® has now made another considerable leap forward in its powerful capabilities as one of the industry’s leading tools for energy production planning, performance analysis and system integration. PVGuard® - skytron energy’s SCADA software for the supervision of photovoltaic power plants - has been expanded in line with changing market conditions for renewable and hybrid power plants; due especially to the opening of the energy market for direct trading on electricity exchanges and the volatility in the investment sector for Renewables which is creating a demand for more versatile tools for production forecasting, flexible reporting, extended data analysis and interoperability. Finely-tuned several times a day, production forecasts supplying estimates of hourly production for up to 7 days in advance support the strategic trading of electricity from solar plants. But not only the commercial dispatching of electricity benefits from production forecasts. Grid connection specifications of some countries, such as California (USA), Puerto Rico, Romania and South Africa, also insist on a reliable prognosis of the power available for grid injection. 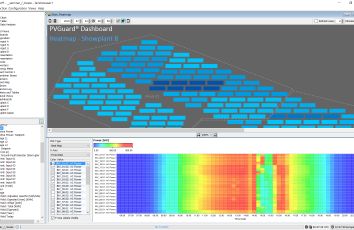 In PVGuard, an auto-adaptive algorithm predicts the power production on the basis of current weather data, plant characteristics and the output over recent weeks. Drawing from the comprehensive database accumulated by the underlying monitoring system and having access to every single measurement value, the new FlexReportXL report generator produces plant performance reports of the highest informative value. Standard report templates may be used as a simple starting point, or effortlessly adjusted to specific requirements. Information from other sources, such as forecasts from the yield assessment report, and customers’ own calculations may be incorporated in the automatic report. 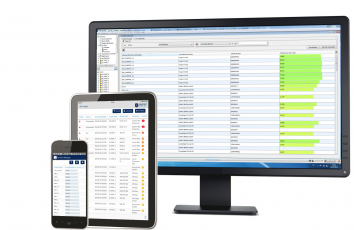 FlexReportXL allows the generation of multiple reports of different content as well as their e-mail dispatch at selectable intervals from an hour to a year. XY diagrams enable the creation of 2D and 3D scatter plots as a basis for systematic function analysis. Thus, for instance, the behaviour of the plants’ solar inverters can be graphically verified by displaying the measured irradiance with respect to the inverter power or voltage values. Similarly, cooling effects on solar modules can be investigated by mapping the measurement values for irradiance, module temperature and wind speed in a scatter diagram. Such in-depths diagnostics are a sound basis for preventive maintenance planning and increase the plant’s availability and efficiency. Investors and O&M companies whose renewable plant portfolios are growing through the assimilation of plants containing diverse technical equipment, highly appreciate the benefits of a unified supervision platform which integrates all their different plants. PVGuard has therefore been opened up to allow migration of measurement data from third-party monitoring components into its long-term database and to refine this data for visualisation, analysis and reporting in the PVGuard environment. When deciding whether to employ such a “soft” data migration or rather to undertake a “hard” retrofit of new sensor and logging equipment, skytron energy provides all the engineering support necessary, including the assessment of the original communication infrastructure of the existing plant.